Why doesn’t paint touch up? Why is it so hard to make touch-ups match? Turns out, it’s all about watching the paint dry. Two painters can touch up the same wall at the same time, use paint from the same can and get completely different touch-up results. Water leaves a paint film as it dries, according to an article by Tony Sharotta, a process engineer for Sherwin-Williams, in Cleaning & Maintenance Management magazine. A dried latex paint film consists mostly of pigment and binder (latex) and contains 100 percent solids. However, in the can, the same latex paint contains only 20 to 30 percent solids for ease of application. How quickly the water leaves the film determines how good the final touch-up work can be. Evaporation and wicking remove water from the paint. Evaporation eliminates most of the moisture but generally does not affect the final touch-up job. 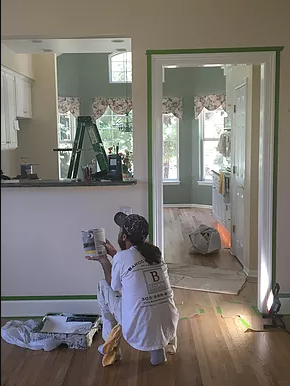 Wicking refers to moisture absorbed into the substrate or surface being painted &ndash which could be a previous layer of paint or even the drywall beneath it. The rate at which wicking occurs is the controlling factor in the final look of the painted surface. When touching up a wall, realize that the paint will wick at a different rate than the original top coat. Reproducing the exact wicking rates each time you paint is virtually impossible, but you can try to influence it. You can slow down the amount of water lost through wicking by diluting the paint when using it for touchups. Diluting paint adds moisture, which slows the wicking rate and increases the time needed for the paint to set up. Dilute the paint by 5 to 10 percent with water for latex-based paint or mineral spirits for oil-based paint. Stored paints can lose moisture, making it more difficult for touch-ups to match the original coat. However, there is good news: Matching older paint colors is easier and more precise with improved color-matching techniques, so you no longer need to buy more paint than necessary for fear you won’t be able to match the color later. Tips for Storing and Disposing of Paint: The key to paint storage is keeping air out of the can. Before closing the can, carefully wipe paint residue from the groove, or chime, and the rim of the lid. Some experts recommend storing paint cans upside-down, but this technique will cause the paint “skin” to form on the underside of the paint. The paint skin is impossible to completely separate from the paint in the mixing process, leaving undesirable chunks. It’s easier to remove paint skin from a can stored upright. Dispose of hardened latex paint with your household garbage. Use hardening agents such as kitty litter, sawdust or products purchased at your local paint store to solidify large amounts of latex paint. Oil-based paint and solvents, including mineral spirits, are considered hazardous waste. You must take special precautions for proper disposal. Check your local regulations to ensure proper handling. Whenever possible, use paint completely or donate it to community organizations such as theater groups, schools, housing authorities or reuse centers. If those options are not available, most counties and states have household hazardous waste collection programs. Find your local environmental agency here. For additional tips, go to http://www.factsfacts.com/MyHomeRepair/storingpaint.htm.